A RUST CHECK SWAG BAG OF GOODIES OR A STANLEY 123-PIECE SOCKET SET FROM NAPA! CROSSWORD GUESS & WIN DETAILS ON PAGES 45 AND 46! FULLY CHARGED FOR ELECTRIC VEHICLES! OWNED AND PUBLISHED BY ALFERS ADVERTISING & PUBLISHING INC.
scan & visit our online hub! 2019 FEDERAL BUDGET EMBRACES ELECTRIC VEHICLES – The most recent federal budget finds the Liberals singing the praises of electric vehicles…. CANADA: FULLY CHARGED FOR ELECTRIC CARS – With the introduction of the allCanadian Solo, Canada stands poised to enter a new era of transportation. THE ATLANTIC ROAD REPORT – PEI introduces new climate change initiatives. TOTAL SHOP WAGE PACKAGE is Measured Against Your Total Labour Billings – The aftermarket may now be considered a “knowledge profession” as Bob Greenwood tells us, but what’s that mean exactly for your business measurements? NEWS OF THE WEIRD – Vanity license plates are a pain in the Assman. NEW BUMPER TO BUMPER STORE OPENS IN STRATFORD PEI – a second location is cause for celebration writes Susan Bradley. TECH OUT A LIME – Would you believe a micro mobility market? Would you believe scooters are the new…go to? It is so, writes Kenneth E. Seaton. AVOIDING THE CARWASH SPRINGTIME BLUES – Tips and tricks to get your carwash up to speed and spring-time ready. THERE’S RUST IN YOUR EV FUTURE – Contrary to popular belief, EVs are NOT immune to corrosion. The question becomes, what can you do about it asks April Chadwick. AN ATLANTIC GRADUATION UNLIKE ANY OTHER – They came from Congo, Sudan, Yemen and elsewhere. They completed certificates in automotive installation and then they…. iRACING AND NASCAR UP THE ANTE WITH eSPORTS SERIES – For those in the know, IRacing.com has been hosting thousands of weekly virtual races for a while now. What happens when, worlds, um, collide? Tim Terry explains. 2019 PRO STOCK TOUR SCHEDULE – With 12 races spread over three provinces between May and September there’s speed happening near you. Dan Hillier dan@autoatlantic.com OFFICE MANAGER James Somers james@autoatlantic.com Auto & Trucking Atlantic magazine is owned and published bi-monthly by Robert Alfers of Alfers Advertising & Publishing Inc. For advertising rates or information regarding Auto & Trucking Atlantic magazine, please call or write to us at: 51 Bethany Way, Halifax, Nova Scotia B3S 1H6. Tel 902.423.6788 • Fax 902.423.3354. 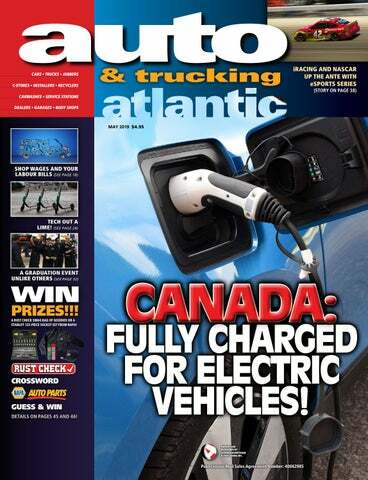 Opinions expressed in Auto & Trucking Atlantic do not necessarily reflect official policy of Alfers Advertising & Publishing Inc. Printed and produced in Canada. COVER AND PAGE 6 ILLUSTRATIONS BY JAMES SOMERS Publications Mail Agreement No. 40062985 Return Undeliverable Canadian Addresses to: Alfers Advertising & Publishing Inc. 51 Bethany Way, Halifax, NS B3S 1H6. and thankfully, in remote locations. The upside to this should be reduction in taxes for charging stations. The downside is that the previous round of funding was allocated to hydrogen fuel cell and natural gas. Obviously, more monies for EVs are critical. Work with Auto Manufacturers and Business to Secure Voluntary Zero-Emission Sales Targets – the budget recommends that some zero-emission vehicles (ZEVs) be eligible for a 100% tax write off the year they are put on the road. EVs, plug-in hybrids and hydrogen fuel cell vehicles would all be considered eligible, including light-to-heavy-duty vehicles purchased by a business. Capital costs for eligible zero-emission passenger vehicles will be deductible up to a limit of $55,000 plus sales tax. This is kind of a big deal. Imagine a fleet of ZEVs being purchased, the whole kit and caboodle able to deduct a princely sum from the total. Speaking of fleets, the budget implies municipalities—which often own their fleets—will most assuredly exploit the program. It also suggests that fleets converting will be accelerated, which in turn, implies a reduction in GHGs a heckuva lot faster than anticipated. Of course, the budget’s not being fully applauded. Almost immediately, the NDP suggested that Canadians will spend more money on foreign vehicles. Case in point: the Chrysler Pacifica Plug In Hybrid---manufactured in Windsor, ON--misses the rebate package because of its $51,000 price tag. According to union leaders, the Pacifica is the only Canadian-built vehicle that could qualify under the federal program, but for the price. As of this writing, petitions are being distributed; war cries are in progress. Far from the perfect, and despite a number of hiccups, the federal budget—as it relates to EVs, anyway-- is nonetheless a solid step in the right direction, a forward-thinking, proactive nod towards the future and an investment in technology that’s here to stay. FULLY CHARGED FO WITH A THREE-WHEELED EXTERIOR, A COMPACT DESIGN AND UNHEARD-OF MILEAGE, CANADA’S CONTRIBUTION TO THE EV MARKET JUST GOT A LITTLE BRIGHTER. portation in Canada. Under their Green and Innovative Transportation initiative Transportation 2030 aims to “work with provinces and territories through a PanCanadian Framework on Clean Growth and Climate Change to support a low-carbon transportation system.” Both the federal and some provincial governments are hard at work trying to figure out what the major barriers are to zero emissions vehicles taking over Canadian roads. “Over the past two years, federal, provincial, and territorial governments have worked closely together to better understand the barriers to greater adoption of these vehicles by Canadians in the following five areas: vehicle supply, costs and benefits of ownership, infrastructure readiness, public awareness, and clean growth and clean jobs. This included significant input from an advisory group, as well as over 160 experts in the field,” says Dupuis. We also spoke with Al Cormier, one of the founders of Electric Mobility Canada (EMC), which was founded in 2005 to advocate and lobby to “accelerate the electrification of transport in Canada.” Cormier explains the roadblocks for some consumers: “The cost is one barrier. The other barrier is what you could call range anxiety. How far will I go before I need to charge? Right now there is a whole national push towards EV charging stations across Canada. Some at level two which takes about three-to-four hours to recharge a car and some at level three which is 20 minutes or less. So there’s a lot of level three chargers being installed. this period. I thank members of the industry for the co-operation and patience they demonstrate each year while these restrictions are in place.” For the purpose of these restrictions, northern New Brunswick includes: the area lying within the counties of Northumberland, Gloucester, Restigouche, Madawaska and Victoria; the portion of Route 108 within York County; the portion of Gordon Vale Road and Holtville Road within York County; the portion of Route 123 within Sunbury County and Queens County; the portion of Bloomfield Ridge Road between Holtville Road and Route 625; and the portion of Route 625 between Gordon Vale Road and Route 8. Details are available online. Labrador Association of Fire Services. We look forward to continuing to work with our fire services partners to strengthen the level of fire and emergency services for Newfoundlanders and Labradorians. Province Reduces Regulatory Burden for Truck and Forestry Industries Transportation and Infrastructure Renewal Road reclassifications to allow efficient truck axle configurations will help make the trucking and forestry industries in Nova Scotia more competitive. “The department has worked with the trucking and forestry industries to identify undue regulatory barriers,” said Transportation and Infrastructure Renewal Minister Lloyd Hines. “Not only do these changes reduce regulatory burden but they will also decrease greenhouse gas emissions by reducing fuel consumption.” The change allows B-trains - two trailers linked together by a fifth wheel – to travel on additional roads, enabling the movement of more materials at one time. This configuration reduces damage to roads because the weight is spread out over more axles. This change represents annual savings of $7 million to the industries. It contributes to government’s $25 million red tape reduction target. “By making these regulatory changes, the provincial government is providing the conditions to make our sector more competitive,” said Jeff Bishop, executive director of Forest Nova Scotia. Government expects the change to become effective by next fall. emissions on farms and sequestering carbon through reforestation. The province negotiated an exemption from the federal government on heating oil under carbon pricing. Removing the provincial portion of the HST on heating oil is saving Islanders $83 million a year. The rebate of the provincial portion of the HST on electricity, propane and wood-based fuels will save Islanders $10 million a year. Through efficiencyPEI’s incentive programs to reduce energy, Island residents and businesses have saved more than $10 million on their energy bills. Taken together, these and other initiatives will save Islanders more than $100 million annually over the next five years, while reducing greenhouse gas emissions to meet our target. Prince Edward Island has the secondlowest per capita emissions in Canada. The provincial target requires annual emissions to decrease to 1.4 million tonnes by 2030. Because of the efforts of Islanders, Prince Edward Island is already one-third of the way to meeting that goal. Islanders are turning to other sources to heat their homes. Prince Edward Island has reduced the use of heating oil by 40 per cent, from 200 million litres in 2003 to less than 120 million litres in 2017. The use of heat pumps has increased by 300 per cent in one year. centives on reducing energy consumption in homes and businesses. This includes financial assistance for energy audits, home heating and insulation upgrades, along with additional assistance for low-income Islanders. Learn more about the Government of Prince Edward Island’s energy efficiency rebates - and how you can do your part to help the environment at www.efficiencypei.ca. was towed. The woman said she’d been in the car for about five hours and seemed unconcerned about what could have happened had the snowplow not hit her vehicle, he said. The car’s battery was dead and she couldn’t roll down the windows. admiring his decision to stand up for himself. Who’s laughing now? dog hot sauce. “That’s his world right there, that dog. She goes everywhere with him,” Tremaine said of the dog. “He would never, ever leave that dog in the car.” What Taylor did not know is that by Feb. 27, his friends had realized that the self-employed building contractor was missing. He had not shown up to work and no one had heard from him, so friends reported him missing. Search and rescue crews combed the forests outside Bend by snowmobile, airplane and drone and as word spread on social media, friends and acquaintances searched on their own using snowmobiles. On Friday afternoon, a snowmobiler found Taylor and he and his dog were brought out of the woods on a snowcat, a type of snow tractor, and they were reunited with family and friends. He returned home to find his roof was damaged from heavy snow and his water pipes were frozen, Tremaine said. come back to life after being underground for over a year. But how far can it go after taking a bottle of Coke? The people at Garage 54 on You tube spared a little of their time and made this a reality. Using an old, rusty Lada, some guys poured a bottle of Coca-Cola into the fuel tank and then drove it around to see far it can go. The car went through the first kilometer without any problems at all. However, after hitting the 1.7 km (1.05 miles) mark, the Lada’s engine started to act up. The driver tried to salvage the car and keep it running but to no avail – the car stalled shortly. He even tried jump-starting the vehicle while being towed but then again, there’s only so much a Lada can take, especially if it’s not really designed to use Coke as its fuel. As expected, the Lada’s oil filter was drenched in Coca-Cola, as well as its carburetor. We’re guessing all the hoses are filled with Coke, too. MONTH AND A HALF AGO, JASON MOOR E OPE NE D HIS SECOND BUMPER TO BUMPER STORE ON PRINCE EDWARD ISLAND. has a warehouse in Moncton and provides next-day delivery. Bumper To Bumper also caters to retail customers. Moore likes the corporate and marketing support supplied by Bumper to Bumper. “It’s been a really good program. The flyers, they help out a lot. With the Bumper to Bumper program, the flyers go out. In Stratford, so far, we’ve gotten really good feedback with them.” Moore recalls his early days in the business, working at what was then known as Kings Auto Parts in Montague, and became a Bumper To Bumper store. He is now a partner in the business with his father Ralph Moore. “I started in the business right from the first, sweeping the floors and doing what everybody else didn’t want to.” Moore now has two children, 13 and 10, who may follow in their father’s footsteps, starting – literally - on the ground floor. “They want to,” he laughed. “That’s how you learn.” Moore certainly loves the business. “It’s a really neat job, every day you’re doing something different,” he said. nology then takes over and riders use the app to; locate the newest scooter location, scan a QR code or just unlock it, undertake their journey, then relock the scooter and the cost of the ride is automatically charged to the credit card recorded on their account. dents with greener, more efficient, and affordable transportation options that also improve the areas urban sustainability. Since it first launched in 2017, Lime has expanded to over 100 markets across the United States and Europe. They hire locally and partner with neighborhood organizations to cultivate community growth through their goal of improving urban living. By the end of 2018, Lime plans to launch in 50 new cities, both nationally and internationally. She says that all her friends also use the e-scooters as a way of getting around in Mexico City notoriously famous heavily congested city streets. In March, LimeNews released figures claiming that 64.2% of micro mobility riders in Mexico City, who indicated – in a Lime conducted survey – that they used Lime e-scooters to transport themselves to or from public transit last month. Lime states that the numbers clearly demonstrate the very real impact that “patinates electricos” are already having on personal mobility in the largest city in North America. sions on halting or removing their scooters from service. Open-minded thinking will enable a company to keep its scooters earning road revenue. It will also allow them to pause service whenever inclement weather may prove costly mechanically or possibly be unsafe for their riders. – either for or against – might prove enormously costly. Responding to public complaints, some cities have gone so far as to ban e-scooters outright. Other cities are conducting pilot projects in designated areas, as they try to figure out just how to deal with the influx of e-scooters. On the counter point, all new business ventures experience some teething problems. You either grow or you go. In fact, the explosion in the e-scooter market has spawned a thriving cottage industry of independent contractors who make money re-charging the electric scooters. The chargers, or “juicers”, pick up the e-scooters, take them to their homes & charge them (usually with only a slight increase in their hydro bills) and then return the e-scooters to the streets in time for the morning rush. By partnering with local key stakeholders Lime and other companies are striving to make game changing improvements to getting around WHERE IT ALL STARTS in an urban environment. Large companies like Ford & General Motors to smaller ones like Uber & Lyft are now investing in the everincreasing more lucrative micro mobility bike and scooter sharing market. Lime’s list of competitors is large, varied and driven. And finally, in February LimeNews reported that the company was now valued at $2.4 billion dollars. They have secured more than 10 million sign-ups and over 34 million trips have been taken on a Lime vehicle. Lime now operates in over a hundred cities, towns, company campuses, universities and communities throughout 15 countries across five continents. ¹ Lime One Year Report, Prepared by: Lime. PDF file. Dec 2018. LECTRIC VEHICLES WE ARE TOLD ARE THE FUTURE, IT C E R TA I N LY S E E M S TH AT WAY, THEY ARE SLEEK, QUIET AND GREEN. EVs are a world away from the exhaust emitting and often rusty regular (internal combustion) cars we all grew up with. Compared with my first car, a 69 Ford Cortina, a Tesla Model 3 or Chevrolet Volt looks as if it could have been lifted from an episode of the Jetsons. ous threads that companies like Tesla have some secret formula to “dip” their cars so that they are protected from rust. All OEMs whether they are building EVs or ICE vehicles do their utmost to protect their cars from corrosion. “New cars are better protected from the factory today than they were 10 – 15 years ago”, says Jim Gordon, the head of research and development at Rust Check. “However, depending on the amount of driving and the level of exposure to bad weather vehicles will show visible signs of corrosion within the first 3 – 5 years.” “Another myth we run into”, says Gordon “is that it is not safe to treat electric vehicles, that the materials we use could damage sensitive electronics.” “Not true, Rust Check’s proprietary Rust Inhibitor and Coat & Protect products have a high molecular weight and unlike tar based undercoating contains no solvents. Our formula actually serves to protect electronic connections from corrosion and moisture.” Rust Check dealers have years of experience protecting hybrid and electric vehicles with no ill effects. Technicians focus on known rust areas, targeting inner doors, quarter panels and fenders, well away from the sealed battery packs. In addition it is becoming unnecessary to drill any holes. Modern cars have numerous body plugs and removable chassis covers that easy allow access to potential rust zones. The rust proofing process has two stages, first the light Rust Inhibitor formula is applied to the inner body panels and under the hood where it can creep into every spot weld and seem. The vehicle is then placed on a lift where a heavier gel, called Coat & Protect is sprayed on the underbody and wheel wells. The products contain a proprietary mixture of chemical bonding agents and corrosion inhibitors that are environmentally friendly and non-toxic. Given the harsh Canadian climate, an annual application of an oil based rust proofing solution is a necessity to survive our brine soaked roads, whether your ride of choice is a BEV, hybrid or full size pick-up. the sales mix. Apart from California, the top five BEV markets are dominated by Scandinavian counties with Norway at an amazing 49.1% of new vehicle sales being all electric. Overall electric vehicle sales in Canada represents 1.5% of total new vehicle sales and will likely remain well short of the government’s target of 5% by 2020. Still, that is a lot of vehicles that will need rust proofing. N MARCH 26, 12 IMMIGRANTS OBTAINED AUTOMOTIVE INSTALLER CUSTOMIZED TRAINING CERTIFICATES OF COMPLETION FROM NSCC AT IMMIGRANT SERVICES ASSOCIATION OF NOVA SCOTIA (ISANS). Eleven of the twelve newcomers arrived as refugees to Nova Scotia within the last two years. They came from Sudan, Eritrea, Congo, Ethiopia, Liberia, and Yemen. Participants learned basic skills in automotive maintenance and safety in the workplace. Most students began with basic or no skills within the automotive trade industry. Over five weeks, they learned the importance of safety and vehicle systems maintenance through in-class theory and hands-on practice in the shop. At the end of the five weeks, students could safely place vehicles on the hoist, remove, install and balance tires, as well as do routine oil and vehicle maintenance. “NSCC Akerley Campus created the ISANS Automotive Installer Program to focus on safety practices, tool identification and usage, along with trade specific terms and language. It’s truly been an honour working with ISANS for 3 years now, preparing New Canadians with skills and knowledge for opportunities in the automotive industry.” - Gord MacKenzie, Trades & Technology Academic Chair, NSCC Akerley Campus Patrick Soumaro is a graduate of the class. Mr. Soumaro received his first and only proof of formal education from ISANS-NSCC customized Automotive Installers’ training. He is one of many newcomers that benefits from ISANS’ programs and services, including settlement support, language training and innovative employment programs and services. OPPORTUNITY TO HIRE Employers in the automotive field have the opportunity to hire immigrants who will not only bring with them essential automotive skills, but also resilience, punctuality, hard work, and passion. Connecting this group of enthusiastic newcomers with employers is crucial for their successful integration into the labour market in Nova Scotia. ISANS work closely with employers to support this goal. Partnership and collaboration are key in the success of this program. Through government funding, a strong partnership with NSCC, and the willingness of employers and business owners in the automotive field, immigrants, former refugees, and skilled workers will become successful, settle, and stay in Nova Scotia. WASTE OIL FURNACES THAT BURN HOT & SAVE MONEY! Monster Energy NASCAR Cup Series cars at venues the real world counterparts runs on, grew the brand exponentially. Tens of thousands tuned in live to the first race to see Zack Novak drive his virtual Roush Fenway Racing Ford to the win at Daytona and a $1,000 first place prize. The exposure of the Series caught the eyes of Chicago Bears Guard Kyle Long, fifteen time Monster Energy NASCAR Cup Series race winning crew chief Steve LeTarte and 2018 Daytona 500 champion Austin Dillon for them to form teams after the season started with drivers who had initially been undrafted in the initial process. A win by Series rookie Eric J Smith at the virtual Auto Club Speedway gave life to those, at the time, 14 independent drivers that with preparation and opportunity they could find themselves winning in the NPAiS. With the new involvement came a boost in the purse. A Series that previously paid its champion $10,000 in cash to win got a total boost to over $110,000. Each race would carry $850 in extra prize money to the top three, broken down with $500 to win each event, $250 for second and $100 for third. Not to mention, the champion’s cheque rose to $40,000 with the eventual second place finisher in the championship in 2019 ($12,000) receiving more than Ray Alfalla did in 2018 for his championship. In total, the top 25 receive a part of the $83,800 total purse money. Add that in with the money available to the podium on each race, plus $500 for each driver that was initially drafted by one of the original 12 teams, and you have a purse of $112,000 in cash for the drivers in the Series. For those keeping score, you can compare the $500 race winner’s purse to local short tracks in Atlantic Canada and you’d be hard pressed to find a local regular lap feature paying that much to win. For comparison, the Parts for Trucks Pro Stock Tour champion, the top short track touring series in Eastern Canada, receives a $10,000 champion’s cheque. Sure, it’s a different comparison from real world racing to simulation racing, but the newfound exposure shines a light on the drivers and teams who spend hours tweaking their race car setups to find extra fractions of seconds to go fast every second Tuesday night. of that area and make a name for himself on major Maritime circuits, those that have watched him in his first year believe he has what it takes to put him in the upper echelons of stock car racing in Atlantic Canada early in his career. ers across the globe that will help build your license through safety rating (a formula based on the amount of safe corners completed) and the aforementioned iRating. You can also join private leagues and race against your friends. If you are a Maritimer, may we suggest the Maritime iRacing League. The MiRL is made up of a number of local drivers, crews and fans of short track oval racing in the region, runs on Wednesday evenings in the winter and is overseen by Ricky Arbeau, a former Atlantic Modified Tour driver and current corner official at Speedway 660 in Geary, New Brunswick. The iRacing.com website is the place to get all the information on the simulation service, including a full list of the over 100 tracks and cars you can race, the minimum PC requirements to run the simulation, news on the various World Championship Series and much, much more. 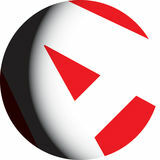 To find more information on the eNASCAR initiatives, you can log on to eNASCAR. com. So, what are you waiting for? Who knows, with track time and a lot of preparation, you could find yourself racing with the top drivers for the big money and fame in the eNASCAR Peak Antifreeze iRacing Series! HE PARTS FOR TRUCKS PRO STOCK TOUR IS PLEASED TO ANNOUNCE THEIR 2019 SCHEDULE OF RACES. THE SERIES WILL CONTEST 12 RACES AT FOUR SHORT TRACK OVALS WITHIN THE MARITIMES, TRAVELLING TO THREE PROVINCES BETWEEN MAY AND SEPTEMBER. The 2019 season will mark the 19th year for the Parts for Trucks Pro Stock Tour. The Series will kick off on Saturday, May 18th at Petty International Raceway in River Glade, New Brunswick and crown a champion at Scotia Speedworld in Halifax, Nova Scotia on Saturday, September 14th in a 200-lap feature. All events on the Series are scheduled for a 150-lap distance, with the exception of 250-lap features at Riverside International Speedway in Antigonish, Nova Scotia on Saturday, July 20th and Scotia Speedworld on Saturday, August 10th. Petty International Raceway will also host a 200-lap main event on Saturday, August 24th. In total, 2,100 thrilling main feature laps are planned for the upcoming Summer! Please note: start times and sponsors will be announced in the coming weeks. About the Parts for Trucks Pro Stock Tour: The Parts for Trucks Pro Stock Tour (PST) is considered the highest level of stock car racing in Canada. The Tour is recognized in the industry as one of the healthiest stock car racing series in North America. PST visits four tracks throughout the Maritimes during its May through September season. The Parts for Trucks Pro Stock Tour is owned and operated by Maritime Pro Stock Tour Limited. For more information, call our administration office at 902.481.2531 or click www.maritimeprostocktour.com. You can also follow us on Twitter at www.twitter.com/prostocktour and like us on Facebook at www.facebook. com/prostocktour. IT’S SO EASY TO WIN! YOU COULD WIN THIS SWAG BAG OF GOODIES FROM RUST CHECK THAT INCLUDES A JACKET, BALL CAP, TOUQUE AND TWO RUST CHECK PROTECTION PRODUCTS. ENTER WITH YOUR CORRECT PUZZLE ENTRY, AND IT COULD BE ALL YOURS! acing fans, NASCAR time is here again Maybe you can name what this winning team is, or anything more about this well know race car. Details please and a FREE Stanley 1/4” and 3/8” Drive SAE 123pc Socket Set from NAPA is all yours! The more the better! Send in your answer at autoatlantic.com/Contest.htm or Fax us at: 902-423-3354, and make sure to include your name, town and province and telephone number. Maybe this time it’ll be you! Deadline for entry is May 15th, 2019. Congratulations to Joshua Arthur Noiles of Newport, NS who correctly answered that the vehicle in the photo is a 1959 Miller-Meteor Futura “Endloader” Combination hearse / ambulance built on Cadillac Motor Car Division’s Commercial Chassis. From the 1984 film “Ghostbusters.” Thank you to all who entered our contest, you could be next!